You live a busy life – always on the go, living off takeout or a quick snack here and there. When you finally have a quiet night, you deserve to eat something a little extra special for all of your hard work, but all you have in your kitchen are the basics. With a little time and creativity, however, you can turn some basic dietary staples into delicious worldly cuisines! There are many possibilities with just a few simple ingredients. Asian cuisine is always a treat, and even more of a treat when you make at home with love, care and the bare essentials. Canned pork from Werling and Sons may seem basic, but it is extremely versatile, making it easy to use to make any mouth-watering Asian-style meal. 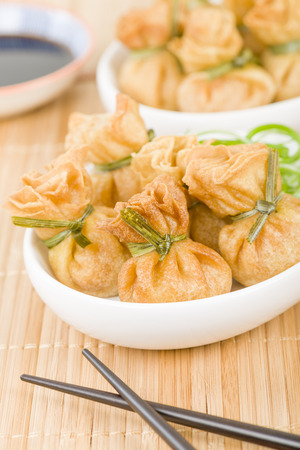 For example, using just a little pork and wonton wrappers, you can make delicious pot stickers or egg rolls. Canned pork can also be used to make soups, like wonton soup, or even substituted for chicken in some recipes. Asian stir fry is another great way to combine many ingredients into a meal that looks just as good as it tastes. Using canned pork, noodles, rice and vegetables, you can bring together a blend of ingredients to create a meal that’s truly extraordinary. Canned pork can be used for many things. It can make the difference between a meal that is thrown together, and one that was made with time and care. Plus, with a long shelf life, you can always keep a can on hand for a quick dinner option whether you didn’t have time to get to the store or are snowed in during a winter blizzard. Werling & Sons has some of the best canned meats in the country. Our high-quality meats are delicious on their own, but they are also extremely versatile and may be used in an array of different recipes. We would be more than happy to ship some to you today. Shop online now to order cans of all-natural pork – or any of our other great products – or call us at 888-375-1998 to learn more.